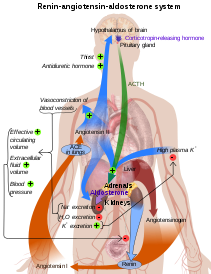 Anatomical diagram of the renin–angiotensin system, showing the role of ACE at the lungs. ^ Skeggs LT, Kahn JR, Shumway NP (Mar 1956). "The preparation and function of the hypertensin-converting enzyme". The Journal of Experimental Medicine. 103 (3): 295–9. doi:10.1084/jem.103.3.295. PMC 2136590. PMID 13295487. ^ Kierszenbaum, Abraham L. (2007). Histology and cell biology: an introduction to pathology. Mosby Elsevier. ISBN 978-0-323-04527-8. ^ Fillardi P (2015). ACEi and ARBS in Hypertension and Heart Failure. Volume 5. Switzerland: Springer International Publishing. pp. 10–13. ISBN 978-3-319-09787-9. ^ Hemming ML, Selkoe DJ (Nov 2005). "Amyloid beta-protein is degraded by cellular angiotensin-converting enzyme (ACE) and elevated by an ACE inhibitor". The Journal of Biological Chemistry. 280 (45): 37644–50. doi:10.1074/jbc.M508460200. PMC 2409196. PMID 16154999. ^ a b Boulpaep EL, Boron WF (2005). "Integration of Salt and Water Balance". Medical Physiology: a Cellular and Molecular Approach. Philadelphia, Pa.: Elsevier Saunders. pp. 866–867. ISBN 978-1-4160-2328-9. ^ Coates D (Jun 2003). 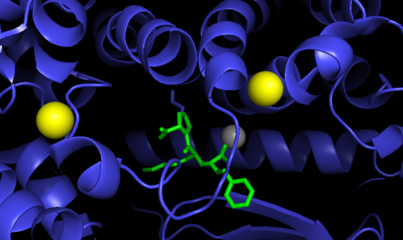 "The angiotensin converting enzyme (ACE)". The International Journal of Biochemistry & Cell Biology. Renin–Angiotensin Systems: State of the Art. 35 (6): 769–73. doi:10.1016/S1357-2725(02)00309-6. PMID 12676162. ^ Zhang R, Xu X, Chen T, Li L, Rao P (May 2000). "An assay for angiotensin-converting enzyme using capillary zone electrophoresis". Analytical Biochemistry. 280 (2): 286–90. doi:10.1006/abio.2000.4535. PMID 10790312. ^ Imig JD (Mar 2004). "ACE Inhibition and Bradykinin-Mediated Renal Vascular Responses: EDHF Involvement". Hypertension. 43 (3): 533–5. doi:10.1161/01.HYP.0000118054.86193.ce. PMID 14757781. ^ Wang W, McKinnie SM, Farhan M, Paul M, McDonald T, McLean B, Llorens-Cortes C, Hazra S, Murray AG, Vederas JC, Oudit GY (May 2016). "Angiotensin Converting Enzyme 2 Metabolizes and Partially Inactivates Pyrapelin-13 and Apelin-17: Physiological Effects in the Cardiovascular System". Hypertension. 68 (2): 365–77. doi:10.1161/HYPERTENSIONAHA.115.06892. PMID 27217402. ^ Bünning P, Riordan JF (Jul 1985). "The functional role of zinc in angiotensin converting enzyme: implications for the enzyme mechanism". Journal of Inorganic Biochemistry. 24 (3): 183–98. doi:10.1016/0162-0134(85)85002-9. PMID 2995578. ^ a b c Zhang C, Wu S, Xu D (Jun 2013). "Catalytic mechanism of angiotensin-converting enzyme and effects of the chloride ion". The Journal of Physical Chemistry B. 117 (22): 6635–45. doi:10.1021/jp400974n. PMID 23672666. ^ a b Bünning P (1983). "The catalytic mechanism of angiotensin converting enzyme". Clinical and Experimental Hypertension. Part A, Theory and Practice. 5 (7–8): 1263–75. doi:10.3109/10641968309048856. PMID 6315268. ^ Klabunde RE. "ACE-inhibitors". Cardiovascular Pharmacology Concepts. cvpharmacology.com. Retrieved 2009-03-26. ^ Brooks L (2004). "The Importance of Treating the Blood Pressure: ACE Inhibitors May Slow Alzheimer's Disease". Medscape. Medscape Cardiology. 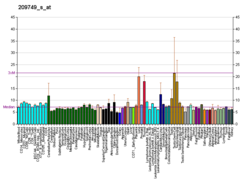 ^ Qiu WQ, Mwamburi M, Besser LM, Zhu H, Li H, Wallack M, Phillips L, Qiao L, Budson AE, Stern R, Kowall N (2013-01-01). "Angiotensin converting enzyme inhibitors and the reduced risk of Alzheimer's disease in the absence of apolipoprotein E4 allele". Journal of Alzheimer's Disease. 37 (2): 421–8. doi:10.3233/JAD-130716. PMC 3972060. PMID 23948883. 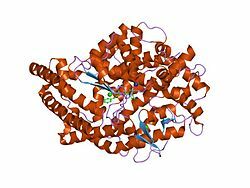 ^ "ACE Enzyme May Enhance Immune Responses And Prevent Alzheimer's". Science 2.0. Retrieved 2016-03-01. ^ Wang P, Fedoruk MN, Rupert JL (2008). "Keeping pace with ACE: are ACE inhibitors and angiotensin II type 1 receptor antagonists potential doping agents?". Sports Medicine. 38 (12): 1065–79. doi:10.2165/00007256-200838120-00008. PMID 19026021. ^ a b Montgomery HE, Clarkson P, Dollery CM, Prasad K, Losi MA, Hemingway H, Statters D, Jubb M, Girvain M, Varnava A, World M, Deanfield J, Talmud P, McEwan JR, McKenna WJ, Humphries S (Aug 1997). "Association of angiotensin-converting enzyme gene I/D polymorphism with change in left ventricular mass in response to physical training". Circulation. 96 (3): 741–7. doi:10.1161/01.CIR.96.3.741. PMID 9264477. ^ Sanders J, Montgomery H, Woods D (2001). "Kardiale Anpassung an Körperliches Training" [The cardiac response to physical training] (PDF). Deutsche Zeitschrift für Sportmednizin (in German). Jahrgang 52 (3): 86–92. ^ Costa AM, Silva AJ, Garrido ND, Louro H, de Oliveira RJ, Breitenfeld L (Aug 2009). "Association between ACE D allele and elite short distance swimming". European Journal of Applied Physiology. 106 (6): 785–90. doi:10.1007/s00421-009-1080-z. PMID 19458960.